It’s been a while since I posted anything. Probably because I’ve been upset since the deal to purchase our house in Orlando fell through. That had a cascading effect of us having to let the house we put an offer on here in Houston pass. The house in Orlando is back up on the market and we’ve had a few showings, but no more bites. In order to get out of the house, Jennifer and the girls used our Disney World season passes and once again went to Magic Kingdom. This time they tagged along with our neighbors John and Laura and their two kids Sadie and Nathan. Sadie is in Kindergarten while Nathan is three-years-old. They had a great time walking back and forth from ride to ride. The one ride they were looking forward to riding because it was so hot outside, Splash Mountain, kept breaking down, so they didn’t get to go on it. Abby lost another tooth and this time wrote a thank you note to the Tooth Fairy thanking her for all the money she has been giving her. Abby has saved up all her money and is now bidding on eBay for a talking parrot that she’s been wanting for some time. She’s a little young for eBay, so Jennifer had to help her out. For some reason Santa Claus wouldn’t bring her the parrot, so she’s resorted to spending her own means at getting the toy. Santa mentioned to me that he thought the parrot talked too much and would bother her parents. That was the reason he didn’t get it for her for Christmas. A few weeks ago I was up in Tomball giving a talk about the game industry at Tomball College. 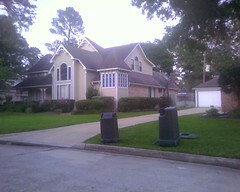 Since I was in the neighborhood, I stopped by my old house in Tomball. Today’s picture is from my drive by the house.